Lesson 5 Assignment: Choose one census year for one ancestor listed in your pedigree chart from Assignment No. 1. Look for the census record for your ancestor and for other persons in the county with the same surname. Last year, I located the 7-member family of Ocie Ola [Ossie in the census] Manning (my great grandmother in my mother’s paternal line) in the 1880 census in Cobb County, Georgia, downloaded the image, and created a citation. It is on hand. Suddenly, I realized that neither search had turned up the Manning family I had identified last year! I used my ED and page number citation to locate the census image on Ancestry.com and used its split screen function to uncover the fact that the name had been indexed as “Maning” rather than “Manning.” The name, at best, is hard to read. It is possible to decipher it with two “n”s in the middle, but, if you do, there’s no room for a “n” before the “g” – making it “Mannig” instead. I updated my citation to include the fact that the name was indexed incorrectly, something I failed to note last year, and changed the access date. I then repeated the searches on both Heritage Quest and Ancestry.com using “Maning” and turned up that family but no more. The 1880 census has also been indexed by Family Search. When I searched on “John W. Manning”, the results included both spellings – Manning and Maning – a better result than either Ancestry.com or Heritage Quest. In the other three families, the general trend is that the older adults were born in South Carolina and the younger ones were born in Georgia. W[alter] Manning and P. P. Manning are Ocie’s paternal grandfather and uncle, respectively, and had been identified previously. 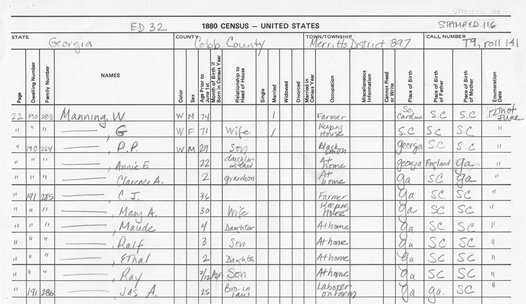 I knew a George Marion Manning to be another paternal uncle of Ocie’s; this was my first census sighting of him. (2) Interestingly, he’s the town clerk and must have lived next door or in the same building as the jail. The connection of Thomas Manning is yet to be determined but given the common South Carolina roots, this will require a closer look. His age of 57, however, puts him between Walter’s generation (age 74) and Walter’s oldest son, George, at 42. He’s unlikely to be Walter’s son. Another interesting figure is Jas A. Manning, living in the household of C.J. Manning as his brother-in-law (but with no apparent wife.) Is that the usual usage of brother-in-law? Was he a cousin married to a sister who had died? Was he a brother of C.J.’s wife but listed with the wrong surname? His parent birthplaces are different than those of C.J. ‘s wife, Mary. Another identity to explore! The Mannings were located in three different enumeration districts (32, 35 & 37), all in Marietta. There is an additional ED in Marietta (36); so I read all four line-by-line to determine if there were any other Mannings. The ink used in ED 35 was particularly faint and hard to read on Ancestry.com. The contrast was much better on Heritage Quest. When I switched, I discovered that images from Heritage Quest load more quickly, making for faster browsing. The EDs and districts were arranged differently. On Ancestry, when you selected Cobb County, it was divided first into townships, then by EDs. On Heritage Quest, there was no further selection by ED after selecting Marietta, so you couldn’t determine what ED numbers you would see until you paged through them. It was an interesting difference. It really is best to use both resources together. (1) The others are http://familyepic.posterous.com/back-to-basics and http://familyepic.posterous.com/seeing-an-old-friend. (2) Williams-Manning-Johnson Family Traditions, Julia Mae (Ellison) Jenkins, compiler (MSS notes, circa 1945-1970; privately held by Tom D Ellison, [address for private use,] Sierra Blanca, Texas; composition of Manning family, reported by Jesse D. Williams, Julia Mae’s grandfather, and Ocie Ola Manning’s husband, circa 1948.